Spinosaurus, a fearsome meat-eating dinosaur with a strange "sail" on its spine, was named in 1915 by Ernst Stromer, a German paleontologist. Estimated to be around fifty feet long, the Spinosaurus lived during the Cretaceous Period. Experts believe that some of its spiny thorns were as tall as six feet. Although not much is known about this creature, paleontologists believe it was a menacing killer. Its Latin name means "thorn lizard" or "spiny lizard." Not many fossils of this giant theropod have been found. Stromer located his specimen at the Bahariya Formation (near the Bahariya Oasis) in Egypt, but it was destroyed during the 1944 bombing of Munich. 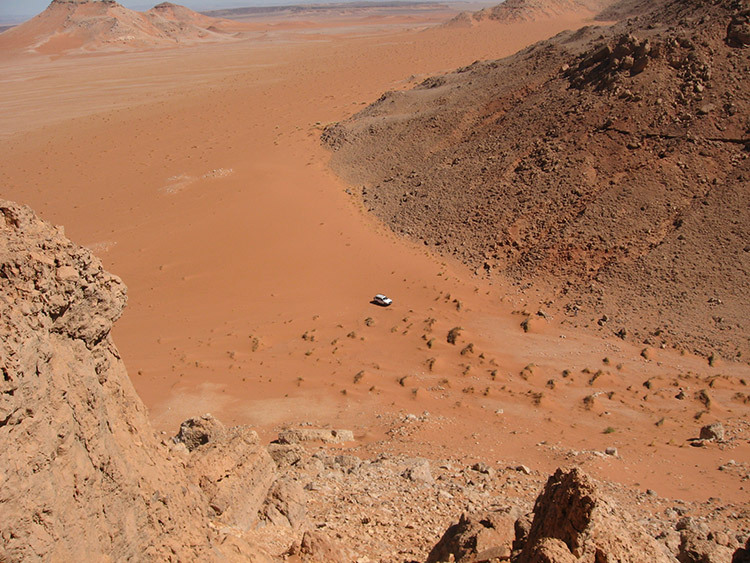 Scientists from Pennsylvania launched another expedition to the Bahariya in 1999. They found a treasure of fossils, including what they believe to be parts of a Spinosaurus. No complete skeleton of this ferocious carnivore has been located to date, however. For many decades, after Stromer's fossils were destroyed, paleontologists were thus unable to conduct extensive research on a Spinosaurus fossil. Then ... another specimen, about 36-feet long, was discovered in eastern Morocco’s Kem Kem fossil beds (pictured below). It had been found by a nomad who walked around with pieces of his findings in a box. A new study about that Kem Kem find—published on September 11, 2014, in Science Magazine’s online version—includes a statement that Spinosaurus was likely an aquatic dinosaur! Nizar Ibrahim, a palaeontologist from the University of Chicago, is the lead researcher on the 2014 study. It was to Ibrahim that the nomad (who didn’t give his name during their first encounter and wants to remain anonymous still) had shown his treasure in 2008. We describe adaptations for a semiaquatic lifestyle in the dinosaur Spinosaurus aegyptiacus. These adaptations include retraction of the fleshy nostrils to a position near the mid-region of the skull and an elongate neck and trunk that shift the center of body mass anterior to the knee joint. Unlike terrestrial theropods, the pelvic girdle is downsized, the hind limbs are short, and all of the limb bones are solid without an open medullary cavity, for buoyancy control in water. The short, robust femur with hypertrophied flexor attachment and the low, flat-bottomed pedal claws are consistent with aquatic foot-propelled locomotion. Surface striations and bone microstructure suggest that the dorsal “sail” may have been enveloped in skin that functioned primarily for display on land and in water. The one thing we noticed was that the proportions were really bizarre. The hind limbs were shorter than in other predatory dinosaurs, the foot claws were quite wide and the feet almost paddle shaped. We thought: “Wow - this looks looks like adaptations for a life mainly spent in water." Was there anything else which resembled a water-based creature? And then we noticed other things. The snout is very similar to that of fish-eating crocodiles, with interlocking cone-shaped teeth. And even the bones look more like those of aquatic animals than of other dinosaurs. They are very dense and that is something you see in animals like penguins or sea cows, and that is important for buoyancy in the water. So if Spinosaurus was actually water-based, could it also function on land? One of the things about this paper [by Dr. Ibrahim and his team] that struck me as particularly neat was the suggestion that Spinosaurus was a quadruped—all other meat-eating dinosaurs were bipeds. It would have moved in a really freaky, weird way in comparison with its relatives—whether on land or in water. ...it would be good to get confirmation, such as the original excavation map, to show that all of the parts definitely came from a single skeleton. One could say that the summer of 2014 has been one awesome season of exciting dinosaur news! Dinosaurs, like Spinosaurus, are not the only magnificent "finds" hidden within the oasis at Bahariya. So are mummies - literally hundreds of them. Paleontologists continue to search elsewhere in Africa, in places like Morocco and Niger, for dinosaur fossils. Their ongoing discoveries are astonishing. Bos, Carole "SPINOSAURUS" AwesomeStories.com. Jun 01, 2000. Apr 26, 2019.